This easy-to-use simulation activity introduces students to the indispensable techniques, principles, and applications of the Polymerase Chain Reaction (PCR) without the need for a thermal cycler. Students will develop the skills needed for further application and study of PCR. 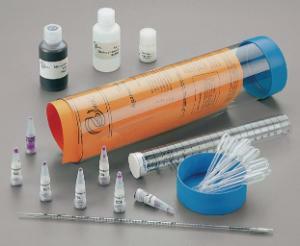 Ready-to-Load™ DNA samples are included to allow for quick and easy setup. Kit also includes UltraSpec-Agarose™ powder, practice gel loading solution, electrophoresis buffer, InstaStain® Blue and FlashBlue™ stain, calibrated pipette, 100 ml graduated cylinder, and microtipped transfer pipettes. Activity requires an electrophoresis apparatus, power supply, automatic micropipette and tips, balance, microwave or hot plate, and visualization system. Material supplied for six gels. Time requirements: 60 minutes.